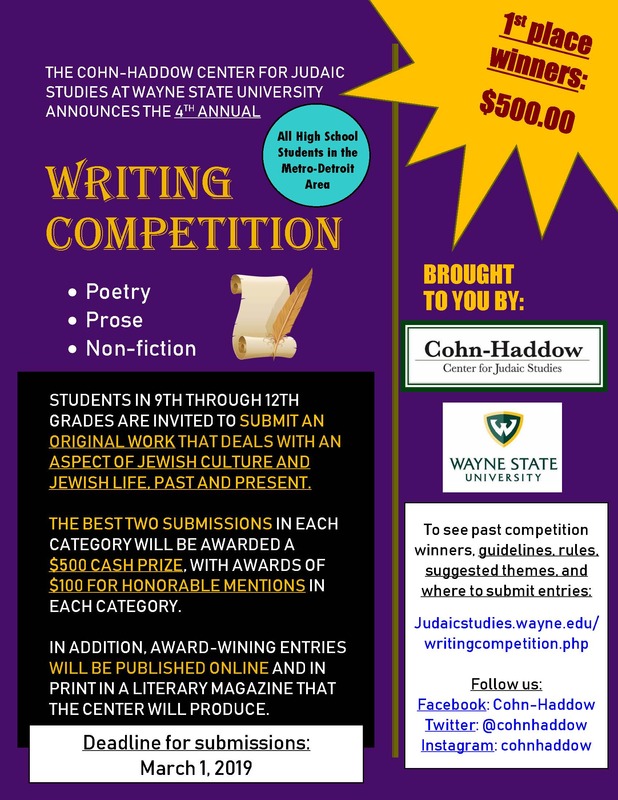 The Cohn-Haddow Center for Judaic Studies at Wayne State University returns for the Fourth Annual Writing Competition for high school students in the Metro-Detroit area. Students in ninth through twelfth grades are invited to submit an original work of poetry, prose, or non-fiction that deals with an aspect of Jewish culture and/or Jewish life, past or present. The best submission in each category will be awarded a cash prize of $500, with awards of $100 for honorable mentions in each category. In addition, award winning entrees will be published online and in print in a literary magazine that the Center will produce. "What does it mean to be Jewish in the 21st century?" "Lessons from Jewish History that are relevant today"
"There is more than one way to be Jewish"
"The Jewish family is an essential feature of Jewish life" "
Jews have survived as a People because . . ."
If you have any questions, contact our Administrative Assistant: andrea.ritter@wayne.edu.